“NGOs are as Canadian as hockey,” declared a 1988 Parliamentary report. 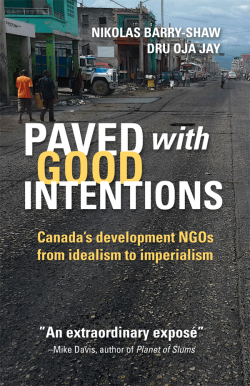 Few institutions epitomize the foundational Canadian myth of international benevolence like the non-governmental organization devoted to development abroad. Join Nikolas Barry-Shaw and Dru Oja Jay to discuss these organizations and their development projects. Just how “non-governmental” are organizations that get most of their funding from government agencies? What impact do these funding ties have on NGOs’ ability to support popular demands for democratic reforms and wealth redistribution? What happens when NGOs support a repressive regime? What happens when NGOs bite the hand that feeds them? "An important piece of scholarship." "A must-read for scholars and practitioners alike." - Sangeeta Kamat, Associate Professor, University of Massachusetts Amherst, and author of Development Hegemony: NGOs and the State in India.